They say behind every successful man there is a woman. I say, behind every successful woman there is a team of wonderful professionals who keep her healthy, beautiful and in tune with the world. For me, there are three entities which – individually and combined – enrich my life, liven up my looks and keep me sane in a sometimes insane world. This week, I’ll share my first secret to a successful life: a healthy body. As much as I believe a healthy diet is the secret to a slim body, eating well on its own won’t build those shiny, perfect muscles and won’t pull everything up and in the way working out will. And when it comes to working out, I’ve tried it all: ballet, flamenco, Pilates, yoga and running. Yet nothing ever worked as perfectly, fast and completely as meeting once a week, for a single one-hour session, with my beloved trainer Elizabeth Hendrix Burwell. 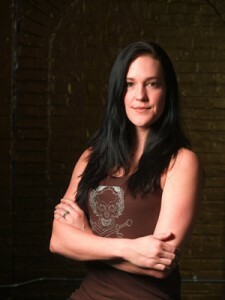 Elizabeth, along with her husband Clay Burwell, owns and runs a boutique gym in Chelsea called High Performance. Both Elizabeth and Clay each have a very personal style of training and can basically kick anyone into shape, with a great combination of dedication, love for what they do and complete knowledge of nutrition, techniques and anatomy. I’ve settled very well into a weekly gig with Elizabeth, who was recommended by a friend. About four months later now, I can boast that my body is the leanest, strongest and most flexible it has ever been. Elizabeth combines strength training with cardio, a few – VERY HEAVY! – weights thrown in, quick repetitions for mind-to-muscle alertness, balance and then ends each session with yoga-related moves and massage for stretching the muscles. If I have an ache, she gets right to the root of it, by working on the corresponding unbalanced muscle. Miraculously, the day after my session with her, my ache will be gone. And my clothes have never fit so well. I have only Elizabeth to thank for that. While the very beginning of my training history with her was insanely funny for me – a combination of whining at how hard everything was, having to buy new bras due to the new increased muscle mass in THAT area (which, don’t worry, decreased again once my body fat ratio also went down) and feeling like a dinosaur (little short arms that I could not move after lifting 25 lb. weights the day before) now all that work is so worth it! My stamina, lean muscles and flexibility are the stuff red carpets shots are made of. For more info, check out the High Performance website, or call their office at 212-675-2777. High Performance is located at 39 West 14th Street, between 5th and 6th Aves, in NYC. This entry was posted on Monday, November 22nd, 2010 at 11:06 am and is filed under Friend's Corner, The List.